Currently on display in Tokyo is “Floating Flower Garden,” an immersive, interactive installation of blossoming vegetation. 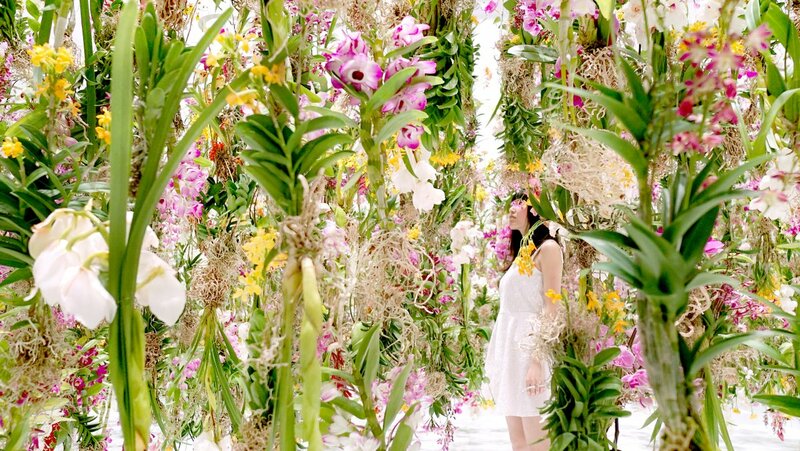 Visitors enter a room filled with floating flowers. But as you approach them the flowers rise into the air, creating an air bubble within the dense forest. Multiple visitors can move through the installation at once as the flowers move away from them and surround them. “In this interactive floating flower garden viewers are immersed in flowers, and become completely one with the garden itself.” Think of it as Rain Room but with flowers. Floating Flower Garden is the latest installation by TeamLab, a Japanese art collective of “ultra-technologists” lead by Toshiyuki Inoko. They’re currently staging a large-scale retrospective of work at Miraikan in Tokyo. The show has been so popular that it got extended for 2 months and this piece was installed as an encore. It’s currently on view, along with the rest of the show, through May 1, 2015.